I have called this company a half dozen times since moving into a newer home less than six months ago. 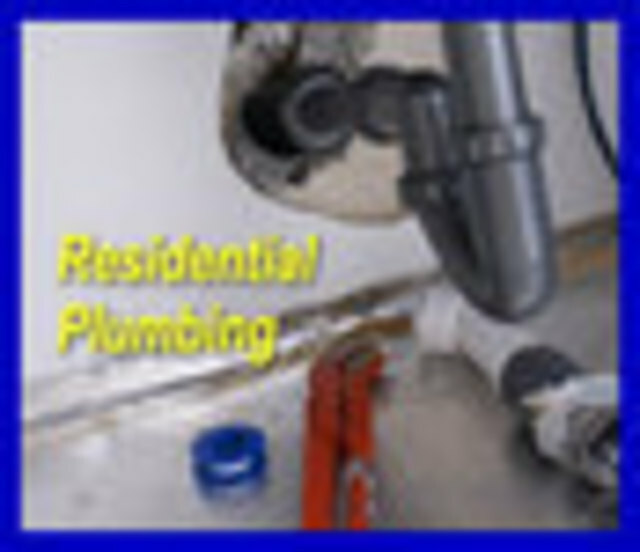 The company has always been able to dispatch a plumber almost immediately and even pulled one off of another job when I had an emergency call. They were most helpful and well informed, especially the younger members of the company. Respectful, knowlegeable and willing to help with suggestions will keep me coming back to this company in the future. I always knew that I would need to replace the outdoor plumbing in the home we are renovating in High Park, Toronto. I had planned to wait until next spring but my hand was forced when the drain started to back up. I had already had a handful of companies out to give quotes for this work, so I knew how much the job would be. Another company charged me $250 to camera inspect the line and determine that the blockage was just outside the exterior wall. That company, however, would only price clearing that blockage, not the entire job (sewer and w/s replacement out to the property line). Their philosophy was that they don't price work they don't camera inspect. So their plan was to charge me $2000 to clear that one blockage, camera inspect at that point and give me a price for the rest of the work based on what they see from there. I didn't like that because it gave me no cost certainly on what the entire job would be. If you're going to dig, might as replace the entire line and the old water service. Brothers gave me a price to do this $4400 and said they would stick to this price no matter what they encountered during the dig. That's why I went with them. I made sure they gave me a detailed contract that spelled out, line item by line item, what they were going to do. The contract said they would excavate and replace the outside portion of the sewer line up to our property line. They would also replace the water service line (an old metal one) and replace it with a 3/4 copper line right into the water meter in the basement. I asked if there was anything they would encounter during the job that would cause them to increase the price, and they said it would happen only if they hit ground water, which they didn't expect for my neighbourhood. They said the job would take 2-3 days and promised to do all they could to ensure I would get the $2000 drain replacement grant from the city (but made no promises). They started digging early Monday morning with two guys and worked hard all through the week. They were not able to do the job in the time they said they would (they didn't finish until Saturday) but that's because the line made a turn underground they did not expect. This made it a longer job but they stayed true to their word and did not try to get any extra money out of me, which I'm sure other companies would do. I will probably get Brothers to replace the inside portion of my line when I get around to that job. I would just recommend to any home owner getting this work done that they ensure the contact spells out every aspect of the work being performed (right down to the material being used, number of cleanouts, etc). Make sure it specifies that the excavation will go right out to the property line and that the water line is going right in to the meter. Also, make sure the company promises not to up the price once they start digging, no matter what happens during the dig (I've heard this is a common foot-in-the-door practice). This is hard work, and somewhat dangerous (the trenches are 10-feet deep) but it's not complicated. Also, make sure the company promises to do work with the city and do everything they can to maximize your chances of getting that drain rebate. Also, get a guarantee so if there's a problems, they'll come back. Our drains run great now and our water pressure is much better. Thanks Brothers. 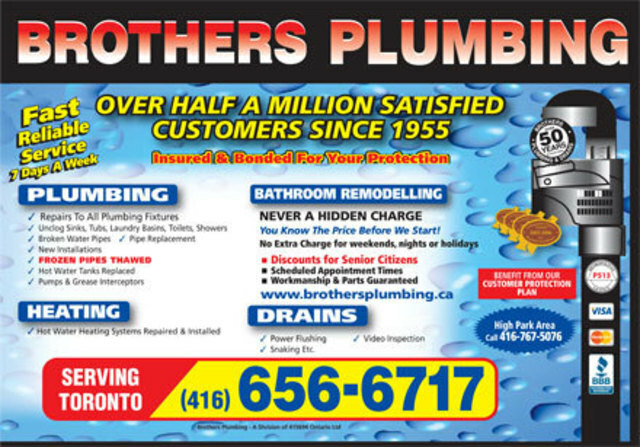 Brothers Plumbing always send the same guys to my house, so I've gotten to know them and trust them over time. Because of my repeat business, they sometimes give me a break on pricing and the work is always prompt and reliable. Most honest and decent plumbers I've worked with. We made an emergency call out to brothers to fix a hot water heater that was exhibiting some strange behaviour. The guy wasn't the most amiable person in the world, but he was hard working, fixed the underlying issue and actually recommending some simplification of the plumbing to reduce the chance of further problems down the line. The price seemed a little steep to me, but i guess you pay for quality. Rick seemed to diagnose the problem as tree roots before he did anything then sent a camera through the pipes. Seemed to be justifying his own diagnoses, yet from pictures seemed unsure, couldn'te understand it since we already had ABS pipes. Starts quoting exceptionning high cost...thousands in no small range. Seemed impatient to talk to my husband on the phone to explain the issue. Felt like he couldn't wait to leave, gave no feeling of confidence to the customer, not particularly courteous. Didn't even offer to absorb the "camera fee" if we hired Brothers to do the work...which is how most other similar type companies do. No customer care here...will absolutely NOT recommend Brothers. The laundry basin in the basement were changed and new tap was installed due to the aging factor of the old basin. 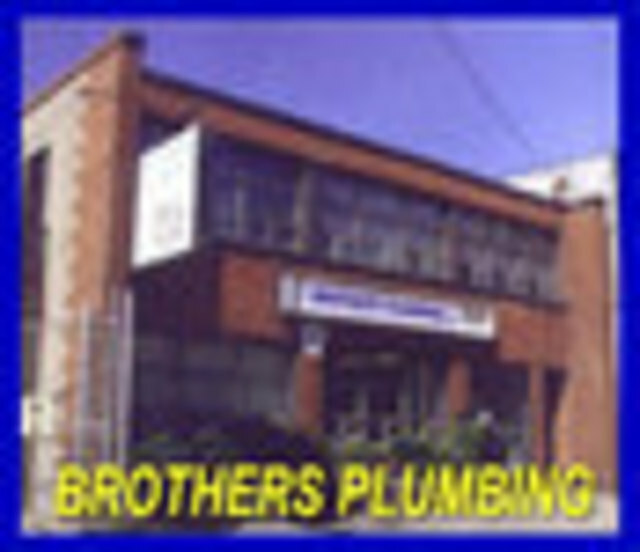 The plumber from Brothers Plumbing Ltd not only did those major works, but did some other minor work surrounding the area without any charge. It was quite a major work as it took almost a whole day but the plumber has never stopped or paused, other than to explain to us what he was doing to help us better understand the concept of fixing the problems. We already recommended him to our friends . Reasonable priced and very well quality of work and results done. Truly and highly recommended. Very genuinely experienced and friendly staff indeed. More than five stars..
Our two basement drains were completely rootbound and caused our AC to back up. Brothers was the 2nd company that came by to assess the issue and the person we dealt with was very clear (while not alarming)in his explanation of what had gone wrong. The crew began work that day and were finished in 24 hours. While on the job, the crew went the extra distance to make sure that the work was completed in such a way as to make further changes down the road easy. The technician sent by Brothers Plumbing was outstanding and very nice. He was able to do the job fairly quickly and effectively. 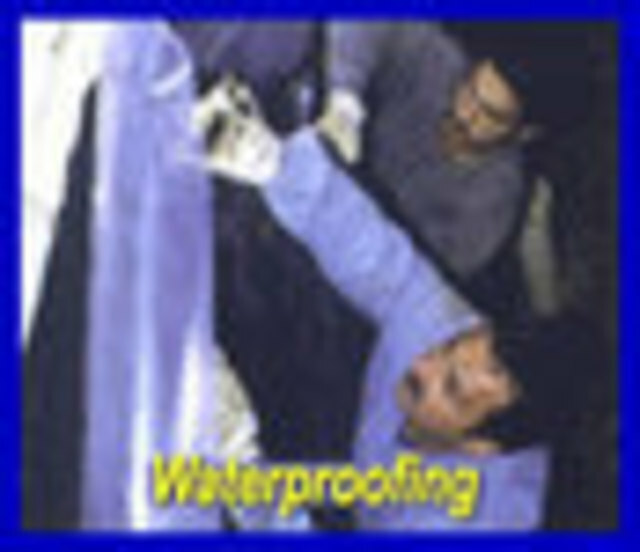 Their technicians seem very knowledgeable and are very good. The only knock against them was that I felt the price was a bit expensive. But overall, very good work.